I absolutely adore this little pup image from QKR Stampede!. Even though I've been on the DT there for more than 3 years now, somehow I hadn't seen it before so it's a completely new image for me! I grabbed it right up and immediately made a new card with it. The expression on his face seemed to work perfectly with the sentiment. Image: "Waiting for a Cookie 7305" Sentiment: "Ups and Downs 11906"
OK, it's the 12th of January and you haven't heard one single word from me about New Year Resolutions so it's time to tell you that, inspired by this sentiment, I'm determined to take it to heart and not sweat out the 'down' times anymore. I'm going to focus on the fact that an 'up' time is always just around the corner! 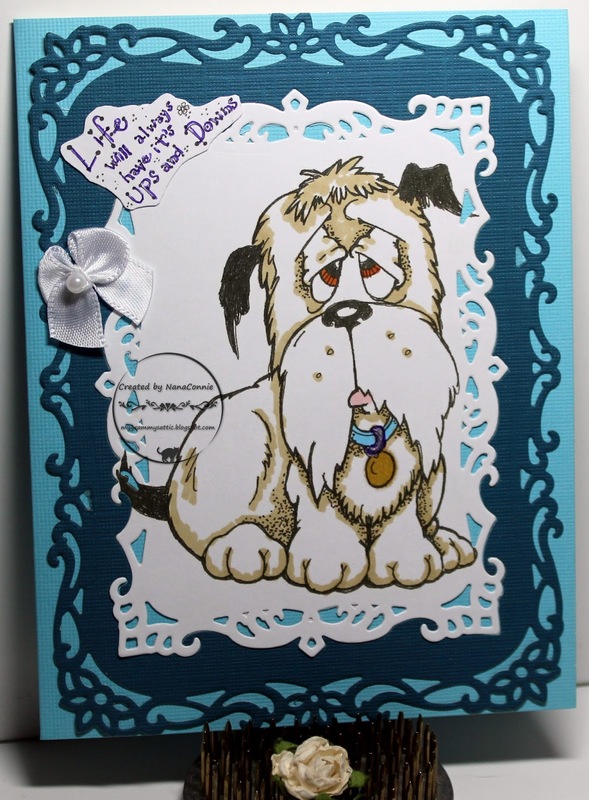 The image is colored with ProMarkers, then cut with a framing die from Spellbinders. I cut a larger frame with another Spellbinders die and mounted the image piece on top of the larger frame. Both of those were layered onto a piece of turquoise CS. I printed and hand cut the sentiment, added it to one corner, and then added one of my little, hand tied, bows. I hope we're going to see you playing along in our challenge this week. Remember, as of January 1, all our themes are "Anything Goes" and there's no twist of any kind. You are not required to use an image from QKR (or even from our sister brand, Eureka) but if you do, your card is entered into a separate draw just for those who have used our brands. That will increase your chances of winning some QKR Stampede images as our prize! This is gorgeous Connie, I do love this image. 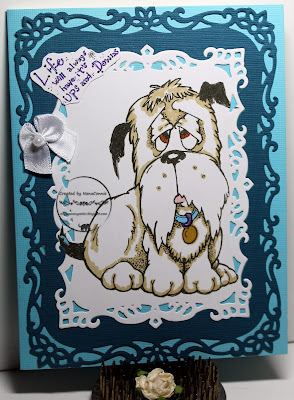 FABULOUS image and the sentiment works so well with him, great dies and design too COnnie. What an adorable card! I adore that image! Thanks so much for playing along with us over at SumMore Fun Challenges! Fabulous card, love that cute doggy! Your card is so CUTE! Thank you so much for joining our mood board challenge at SumMore Fun! Hahaha, this dog is adorably sweet, and what child wouldn't love to receive it. Saw your entry on SAS4Kids and came in to take a closer look - fabulous! What a adorable card!! love that cute image!! Thanks for joining us at Cut it Up challenge!